No one can really call himself a magician, unless he can pull a rabbit out of a hat. It is the most expected trick in magic today. Even though few magicians do it; you always have kids asking, "Are you going to pull a rabbit out of a hat?" Potential clients calling about birthday parties, often ask if you can pull a rabbit out of a hat. Some magician's try to pacify the mothers or children using a mirror box production of a rabbit. Good try, but it is not the same. 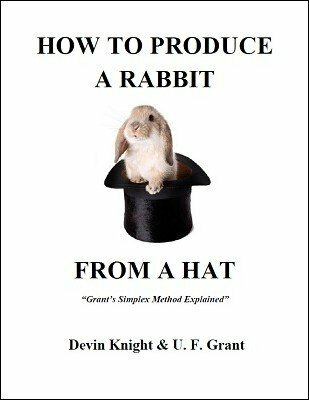 People want to see a rabbit produced from an empty top hat, or even a borrowed hat. If you can do this; you have a big advantage over other magicians in your area. You can tell prospective buyers that you actually produce a live rabbit from a hat, and it can be a borrowed hat, if the father has one. Magicians who produce rabbits can use this as an up sale and often get $25 more for doing this one trick. This PDF explains U. F. Grant's simplex method, expanded upon by Devin Knight. Now you can easily add this to your shows and make your clients happy. Do it with a borrowed hat. Not limited to a rabbit, you can use this method to produce a kitten, a guinea pig, a dove or even one of the spring rabbits sold by magic dealers. You can produce anything that will fit into a hat. This PDF has an important section on the proper way to hold and produce a rabbit. Many magicians harm and hurt their rabbits because they don't know these vital facts. Devin tells you what you need to keep your rabbit safe and happy. Includes special routines for both Easter and Christmas with the rabbit. Bonus Section: Included is a selection of rabbit jokes you can tell after the show, while the children pet the rabbit. This will add to your entertainment value.